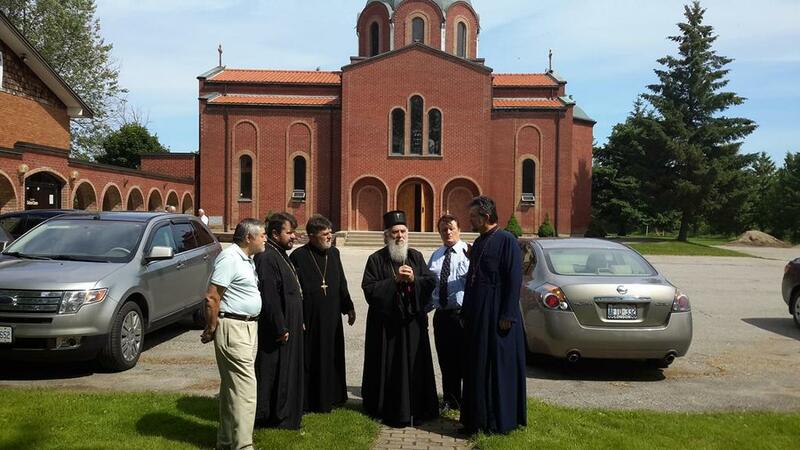 London, Ontario - His Holiness Serbian Patiarch Irinej, administrator of the Diocese of Canada, visited the St. Sava Church in London on Wednesday, June 18, 2015. London is a city in the Canadian province of Ontario. It is located between lakes Huron and Erie, half way between Detroit and Toronto. It is one of the industrial centers of the province. Important industries include the auto industry (locomotives, military vehicles, car parts), biotechnology and information technology. The international airport of London is located 10 kilometers from the city. The first fort here was built in 1826, whileLondon has had the status of a city since 1855. 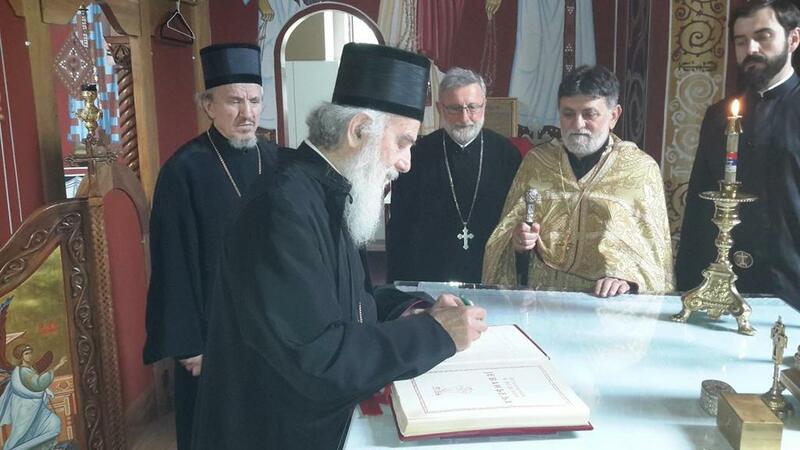 Accompanying the Serbian Patriarch was His Grace Bishop Mitrophan of Eastern America, V. Rev. Stavrophor Vasilije Tomic, parish priest at St. Archangel Michael in Toronto and Episcopal Deputy, Protodeacon Damjan Bozic from Belgrade and Milan Lesic, president of the St. George church-school congregation in Kitchener. 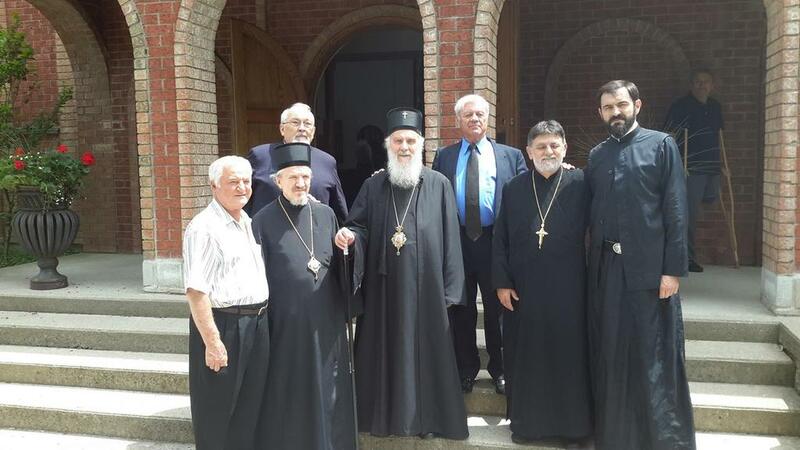 His Holiness Serbian Patriarch Irinej was welcomed by many faithful, led by their parish priest V. Rev. Stavrophor Vasa Pejovic. The Doxology was served by Fr. Pejovic together with Protodeacon Damjan Bozic. Chanting at the chanter's stand were Bishop Mitrophan, Fr. Vasilije Tomic, Fr. Voja Pavlovic and Fr. Milojko Dimitric. Fr. Vaso welcomed His Holiness saying that this is a great day for this small Serbian community, even though far from the homeland stands firmly with the Mother Church. Patriarch thanked everyone for the warm welcome. Upon the initiative of bishop of Eastern America and Canada, Bishop Stefan (Lastavica) of blessed memory the St. Sava Church in London was founded in 1965. Six years later, in 1971, property was purchased where the chapel and hall was constructed. On the same property in 1984 the foundation for the new church was consecrated by Bishop Christopher (Kovacevich) of blessed memory, later Metroplitan of Midwestern America. The church in London, dedicated to the first Serbian Archbishop St. Sava, was consecrated by Bishop Georgije in 1988. Eleven years later in 1999 a new church hall was built and blessed. The Circle of Serbian Sisters "Ognjena Marija" is attached to this church and is very active, aware of their historical role in the service of the Church. The "Bishop Stevan Lastavica" choir was founded fifteen years ago. During the holy liturgies and other services, the choir completes and enriches everyone's spiritual longing. The Serbian school "Sveti Sava" functions successfully, drawing its knowledge from the church library "Logos", founded in 2012. The "Svetosavlje" folklore group for more than 20 years has been active in teaching and nurturing the Serbian culture and traditions in traditional Serbian folk dress.